This is the second set of photos Lexie took for me using the 50mm lens that I mentioned in this post. Like the others, these are not quite as sharp as they could be, but hopefully by the time you are actually reading this post we might have sorted things out. 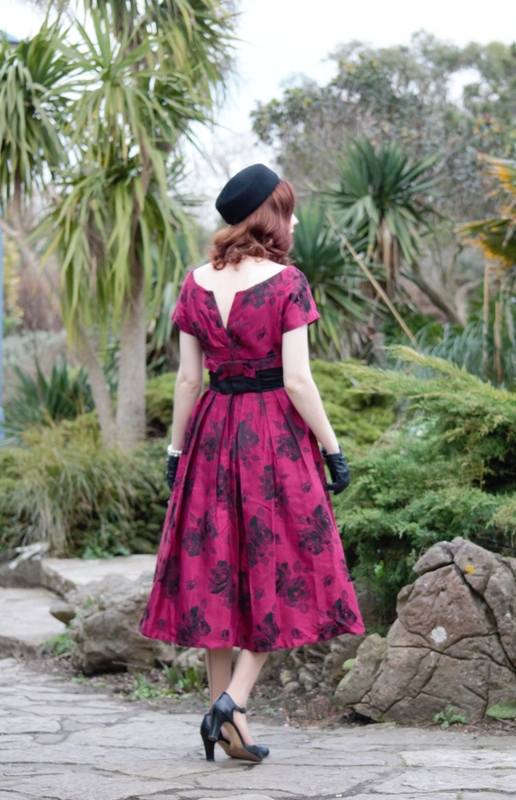 Anyway, camera niggles aside, this stunning original 1950s dress is a relatively new addition to my wardrobe, having been purchased sometime towards the end of last year. I actually wore it on Christmas day but never got around to photographing it and as it's definitely evening wear, I haven't had an occasion to wear it since. I love the beautiful bows up the back, although this isn't a dress that I can manage to get into by myself as it features both a back zip and about 4 or 5 hooks and eyes in various places. I also really love that unusual V back and the pretty sash, although its made of a very creasy material and it has pleats which I keep telling myself I won't buy because I absolutely hate ironing them, especially when the dress is just going to crease up anyway. Let me introduce you to my newest Dolly and Dotty dress, the Vanessa Classic 50s Inspired Check Dress in Navy. I took her for a spin in Windsor which I think might quickly become one of my go-to places for blog photos. This particular day we were expecting fine weather according to the forecast, and although it was nice all morning, we did get caught in a short hailstorm while walking around the town. Although it was really cold, it did give the streets an extra pretty touch for us walking around which I hope comes across a little bit in the photos. I did really enjoy wearing this dress and exploring a few of the old streets. The location where these photos were taken is actually one of my favourites just opposite the castle; it has such a charming look to it. As far as the outfit goes, I thought long and hard about whether to get this dress or not - not because I have any kind of problem with Dolly and Dotty (I am still a big fan), but just because I am trying to be really conscious about what I bring into my wardrobe. At the moment I'm working really hard on making my clothing and makeup collections work for me, and work hard at that. With makeup I'm really into minimalism at the moment and I'm working on paring down my fairly large collection into just a core set of products that I love and wear every day. With my wardrobe, the goal is less minimalism and more cohesion. I definitely didn't set out to get myself into this position but over the last few years my wardrobe has become more and more print-heavy and as such I do find that I have a number of items in different patterns which I find really hard to match with other things. I have earmarked some items for sale and to give to charity, which will hopefully allow me to see the wood for the trees a little bit better but in the meantime I am kind of trying to avoid prints a bit in favour of buying plain items so I can mix and match a bit more easily. It's a slow process because I'm still more or less on a self-imposed spending ban as far as clothes go, but I'm still accepting some brand sponsorships (which I am very very grateful for) that I still need to consider in the same way. It's just very me. It's sooo cute and sweet without being girlish. My friend Aliesha said it makes her think of me cycling along in the summer with a picnic, and I know exactly what she means. I'm living my Summer Holiday or maybe Come September fantasy. (Hmm, Cliff or Rock? Cliff or Rock...?). I'm wearing a size 8 which is a little tight on me around the shoulders but I currently match the size 8 bust and waist measurements much better than for the size 10.I'm always in between sizes in Dolly and Dotty and just fluctuate a bit between being closer to the size 8 and closer to the size 10 - if only there was a size 9 available! Anyway, it also has a red lining which is quite unusual. It shows through the white squares just the teeniest bit if you get right up close, but it isn't noticeable when you're wearing the dress unless someone is closer than is really polite! Hopefully soon I'll be able to show you some other views of Windsor as it really is beautiful. Please do keep an eye out for my bits coming up for sale and let me know in the comments if you have any preferences for where I should be selling things. 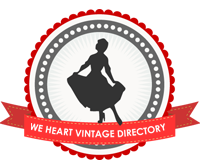 Is through the blog or on Facebook good or would we prefer to stick to Etsy? Hello everyone! 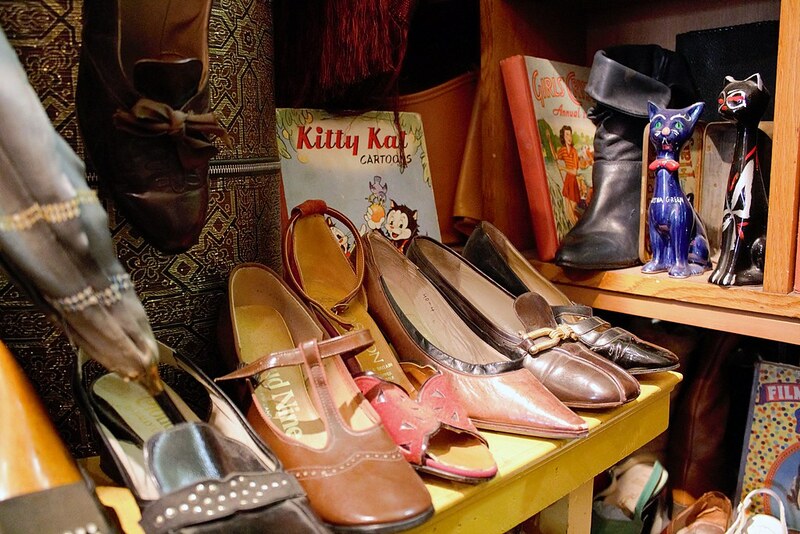 Today I'd like to share with you some of the shops in Southsea that I like to visit for vintage shopping. For this post I have three shops to talk about. There are some other vintage and antiques shops in the area as well, but some of them don't sell my type of vintage and a couple of others that I do like were closed on the particular day that I took these photos so I will hopefully be able to include them in another post in the future. Without further ado, here are the shops I'd like to share with you for today. 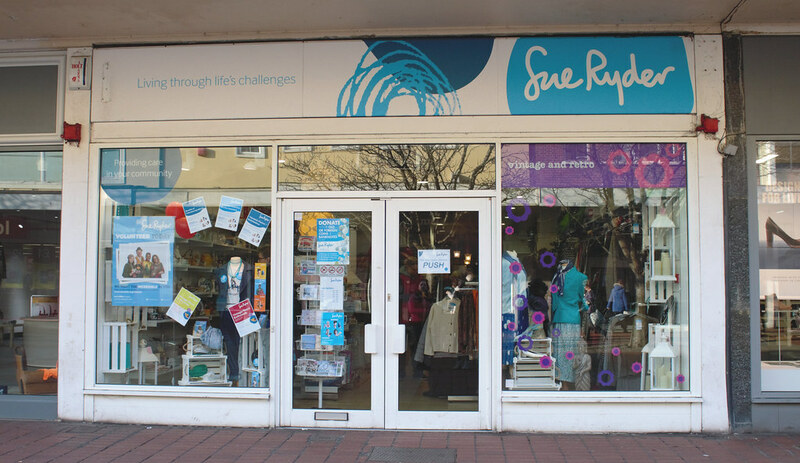 First up we have good old Sue Ryder, which many of the English vintage babes will already be familiar with. Sue Ryder is a hospice charity, and the shops often have a really decent vintage and retro section. The Sue Ryder shop in Southsea is the closest one to where I live, and is the shop where I buy the most of my vintage at the moment. 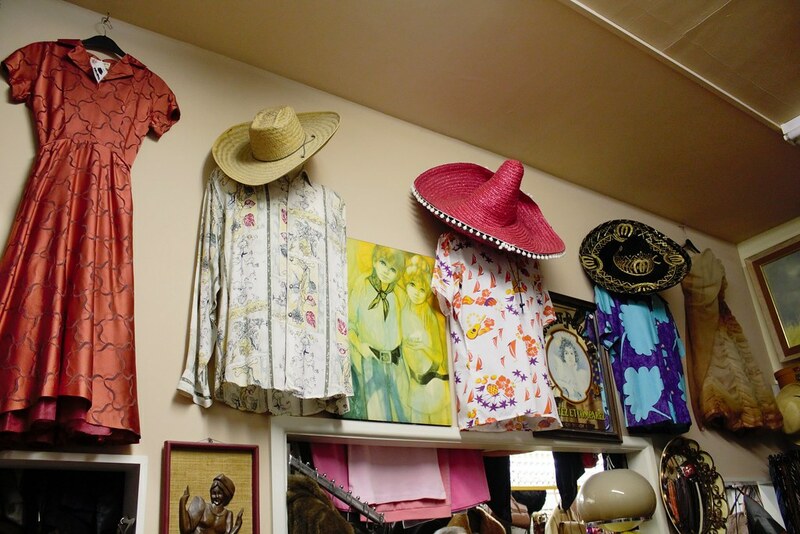 The vintage section in this shop is quite big, although as with any charity shop you have to visit often to find the best things. I usually pop in about once a week or once every couple of weeks, and sometimes I only find reams of 80s polyester and lumpy hand-knitted jumpers. Other times I will come out with two or three lovely items and indeed some of my favourite clothes have come out of this shop. One thing to bear in mind is that the items here are not premium vintage, so I will often have to make small repairs such as darning a hole, fixing up a hem or replacing a zip. However, if you're able and willing to fix things up a bit, this is an excellent budget option. 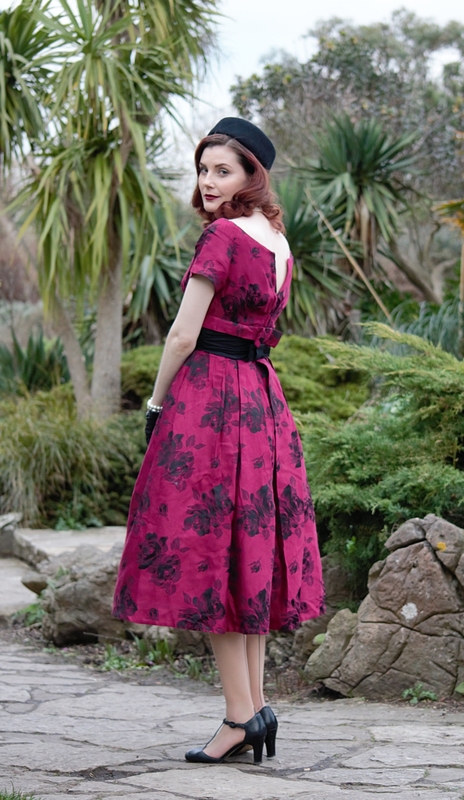 I will normally pay no more than around £20-25 for an original 1950s dress and have found some for around £15. To me, the saving is well worth having to reinforce a seam here and there! 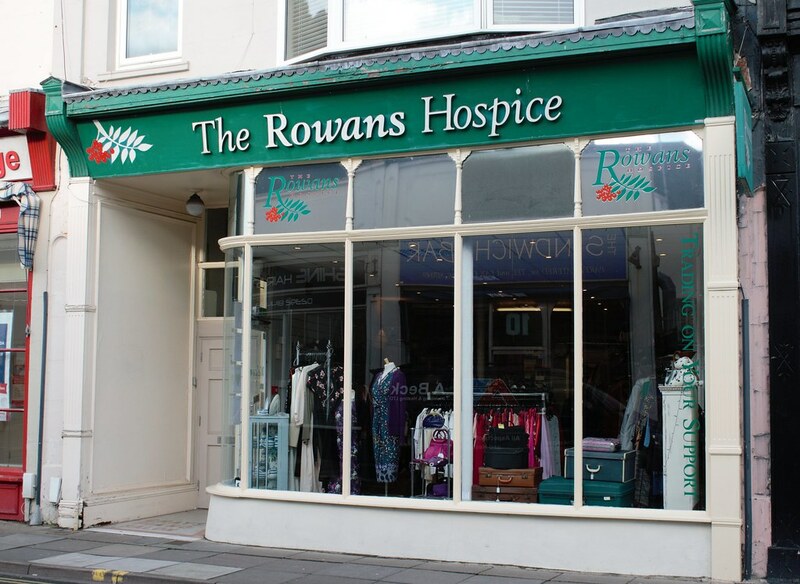 Next we have The Rowans Hospice shop; another hospice charity but this time covering a much smaller area of Hampshire. Overall I find that the vintage selection here is a bit smaller than in Sue Ryder, but there are still plenty of interesting bits and bobs. 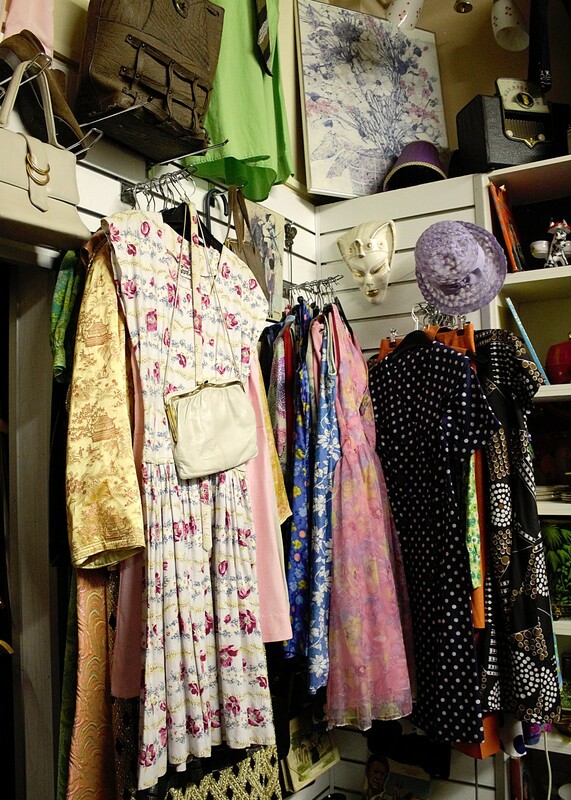 Again as it's a charity shop, you will generally speaking pay a bit less for items than you would from some specialised vintage shops, but depending on what type of vintage clothing you like you might be less likely to find what you want or you may need to make small repairs. 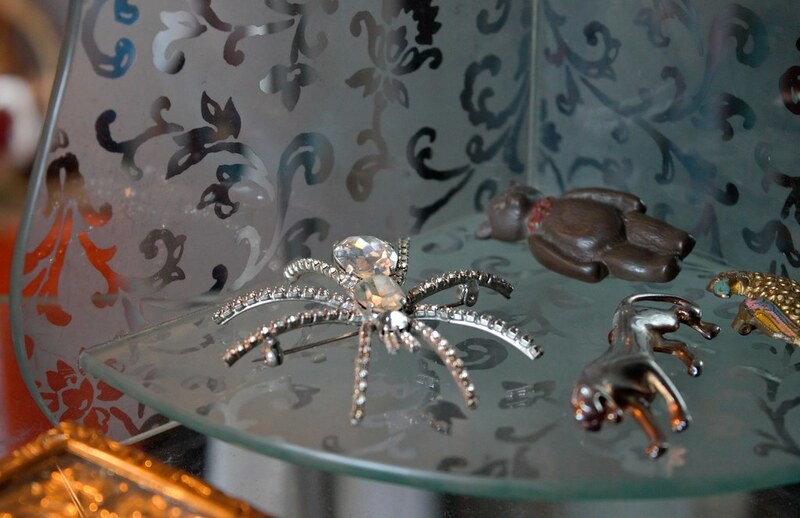 As a side note they do often have nice things in the window so if you're walking past it's worth having a quick look. In fact, I am often tempted to wander inside after seeing a pretty dress on one of the mannequins as I've been passing by. 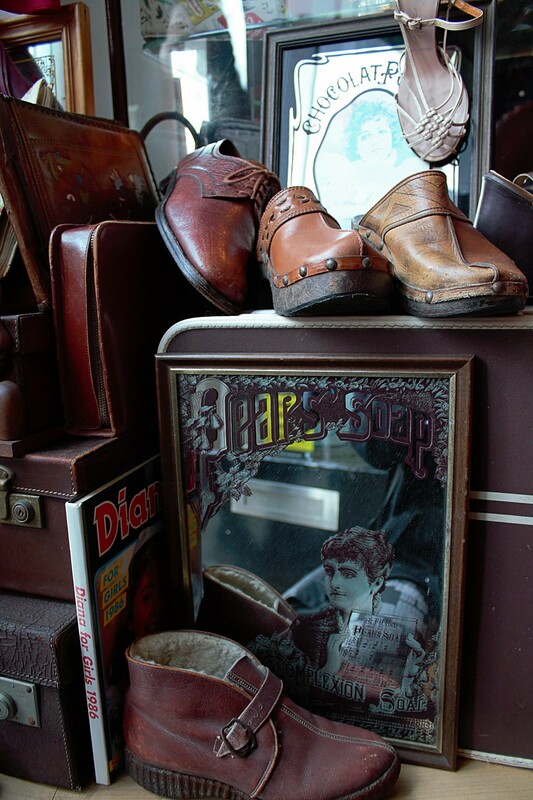 Lastly for today we have One Legged Jockey, an amazing treasure trove packed full of top quality vintage clothing and accessories. This is one of those shops where I have to be very strict with myself to avoid overspending! The folks at One Legged Jockey were kind enough to let me take some photos inside which I'm happy to be able to share with you here. That being said, the photos do not in any way do this wonderful shop justice so I urge you to visit for yourself for the full experience. 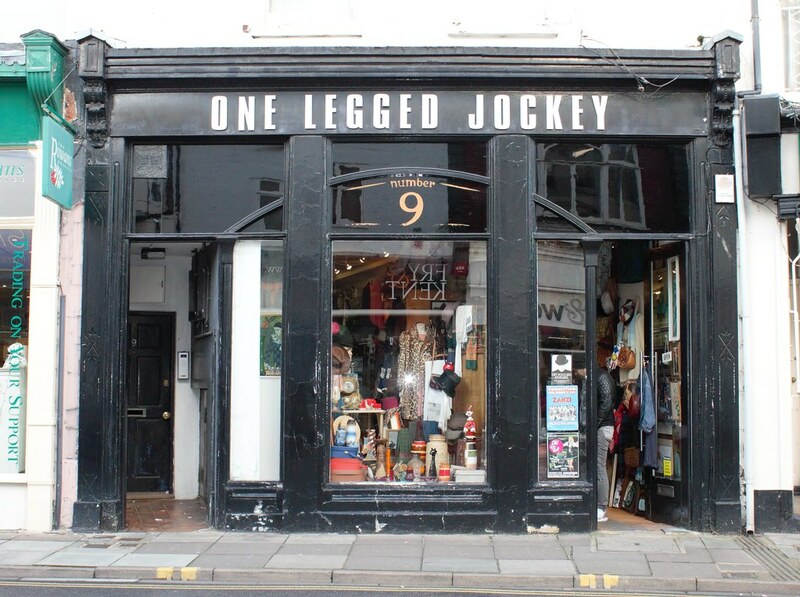 As One Legged Jockey is a specialised vintage shop the prices here are generally higher than in the charity shops (as you'd expect), but for that money you can expect some really special pieces and wonderful quality. In addition, I wouldn't say that it's an expensive shop compared to other vintage shops. At around £70 for a 1950s dress I'd place One Legged Jockey solidly in the "average" category, though of course your mileage may vary. Either way, this is a great interesting shop to visit, especially if you've got some time to have a thorough dig through all the racks. 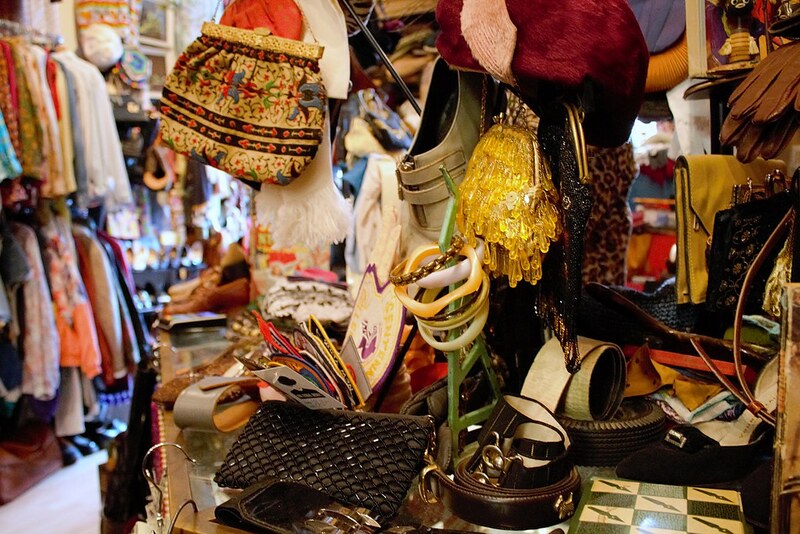 Last but not least, if you're interested in seeing some other similar posts about vintage shopping in other cities, you can do so here. So far the list includes Matlock, Brighton, Haworth, Leeds, Derby, and Oxford. Sadly some of the shops featured have since closed down but you can still see all the pictures and wish that they were still open! 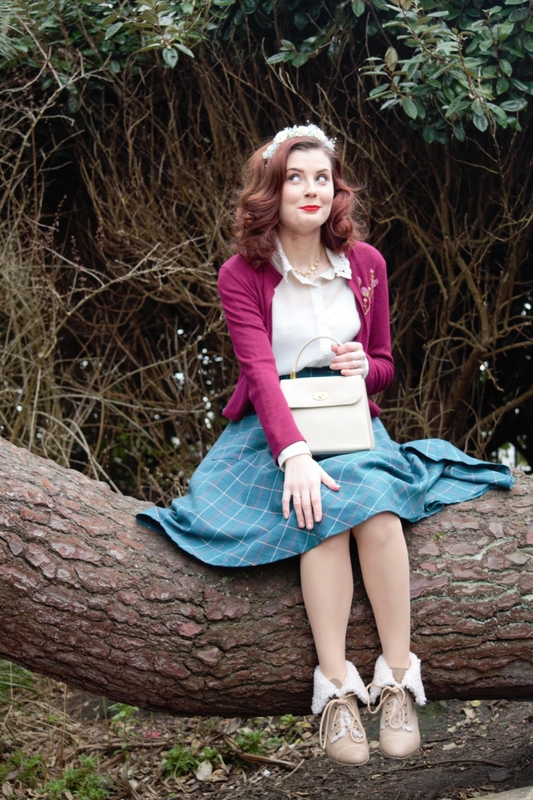 Disclaimer: The skirt featured in this post were provided free of charge in exchange for a review by Blue Banana. This post contains affiliate links. All opinions are my own. Just before Christmas my fiancé's dad gave me a Sigma 50-200mm lens to try out. These photos were taken on the lens' second outing whilst being in my posession, with my good friend Lexie behind the camera. I'm very excited about the possibility of being able to use the lens for blog photos on a more regular basis but as I'm sure you can spot from these photos I am having a few teething problems as the photos aren't coming out quite as well in focus as I'd like. Although they're not perfectly sharp I wanted to share them anyway, firstly because I do still like them, and secondly because I wanted to use it as an opportunity to ask for advice from any of you with more photography experience (and skill!) than myself. I did discover that the optical stabilizer on the lens was turned off on these photos (and on another set which you'll be able to see at a later date), and I'm hoping that turning this back on will improve things. I am also planning on trying out the lens on a tripod to see if it makes a difference. If anyone out there has any other advice or tips I'd be really grateful as I'd really like to be able to use the lens to its full potential. 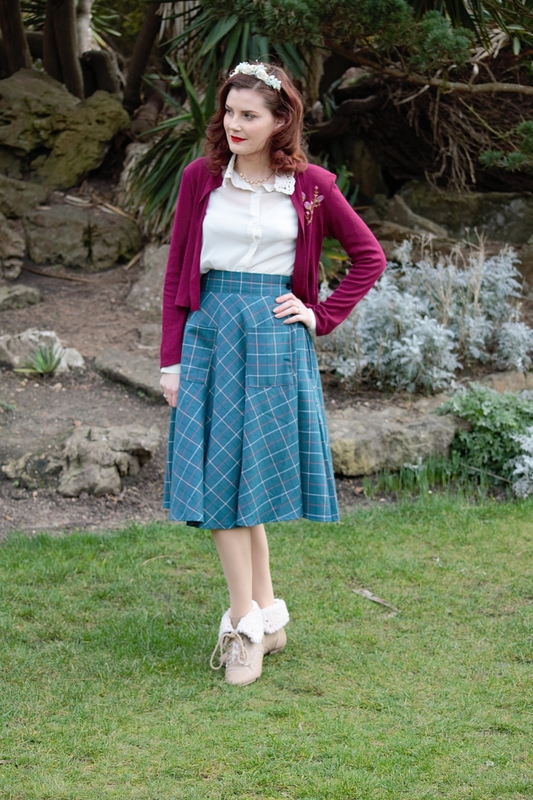 Anyway, the subject of today's blog post is not my photography-related woes, but instead is this outfit which features several items which have not been included in blog photos before. Starting from the top, the first new item is my lovely floral headband which I picked up for a song about a week ago in my favourite local vintage shop (more on that in an upcoming post). The flowers themselves look quite old to me, and are typical of those that turn up on mid-century hats and bridal headwear. However, the construction of the headband makes me think that the flowers were either purchased separately (maybe from a millinery or craft store) and attached to the band, or have been repurposed from another item. Nevertheless it's a very beautiful (and delicate - some of the flowers are made of paper) item which I will really enjoy wearing. 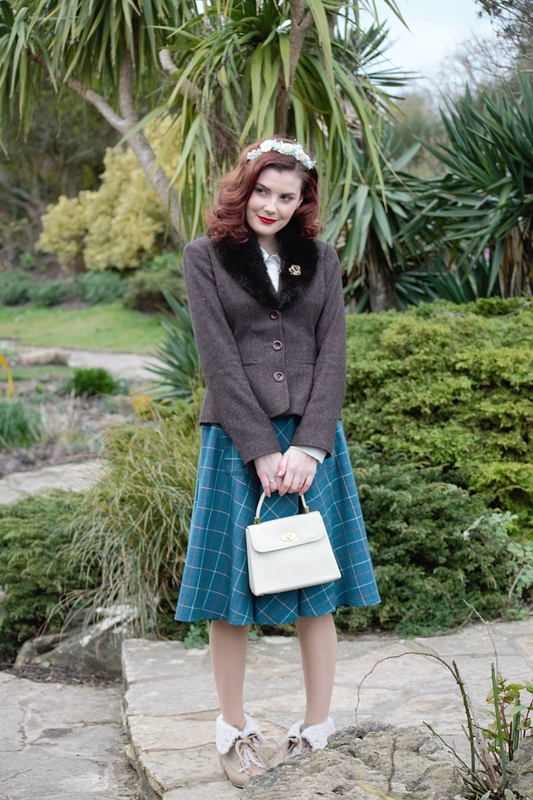 Next up is my sweet little cardigan, which spent most of the day hidden beneath my favourite jacked (complete with my little crown brooch from Tegen Accessories). It's a bit difficult to tell from the photos but the flowers on the front are 3D. This actually came from my fiancé's mum as she said she doesn't wear it any more, but it goes just perfectly with this skirt, which is the Banned Maddy Tartan Skirt in blue (more about that in a minute). Alongside the cardigan I also have this cream kelly bag, which my friend Jo gave me and which I featured in my thrifted and gifted haul and try-on video. It's actually not vintage but is the perfect style to fake it (and actually isn't at all dissimilar to a genuine vintage cream kelly bag I have that used to belong to my granddad's late first wife). It looks small but I actually managed to cram loads of stuff in, which is very important for me as I seem to always carry plenty of stuff around. Lastly I have some very warm and stylish pixie boots which were passed along to me by Lexie (my friends and family are all very generous!). Unfortunately that lovely faux-sheepskin around the top doesn't extend inside the boot (I bet that would be extra cosy) but you can flip the top up and wear them in more of an ankle boot style which I have also done. I do love versatility in my wardrobe, it's like having two pairs of boots in one! 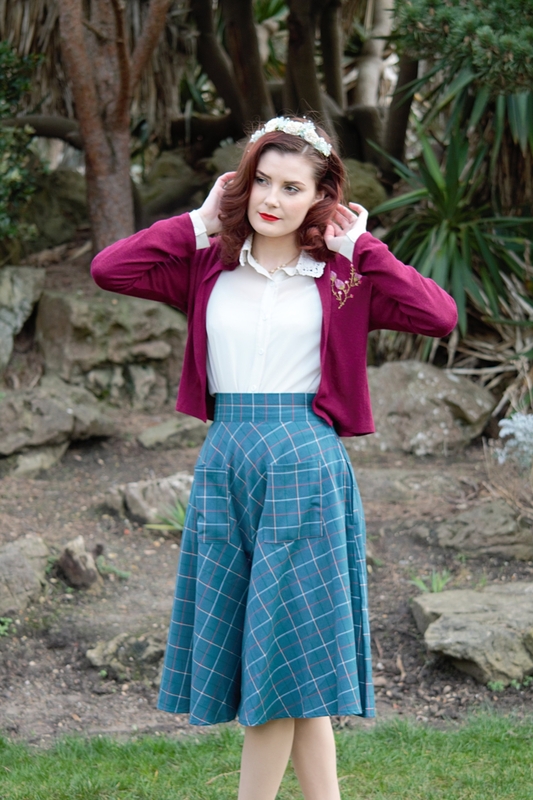 The skirt was sent to me to review for you guys by Blue Banana, who have a lovely selection of retro and vintage reproduction clothing, mostly in a 50s style but with a couple of other decades thrown in here and there. 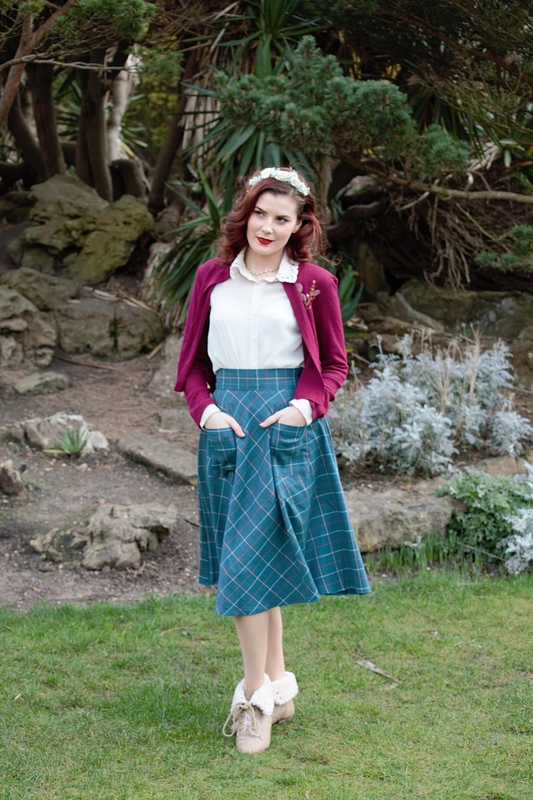 Some of the clothing is much more rockabilly or even psychobilly/more punk inspired, but there are also plenty of items that suit a more authentic vintage wardrobe as well. For me, the skirt is the perfect style. I wear a lot of tartan and check prints so it just called out to me, and you see those pockets? Yep, they are absolutely real, and they are huuuuuge. I love them for popping my phone into when I'm just pottering about the house and I know how much of a selling point functional pockets on womens clothing are to a lot of you. They also feel fairly sturdy, so even carrying a heavier item like my phone doesn't drag the skirt out of shape. The inside edges of the pockets have been left raw though, which makes me wonder if over time using the pockets will cause those seams to fray more. (Just to clarify, all the other seams are finished). I'm wearing a size XS, which fits me absolutely perfectly. According to the size chart on the Blue Banana website, this is a 26" waist. It's available in sizes XS through to XL from Blue Banana, and at the time of writing it is in stock in every size. The fabric of the skirt has a very nice feel to it, and a decent enough weight to give the skirt a nice shape and some movement as you walk. The only problem I did find was that it creases like nobody's business, and by the time I had finished ironing it it was all creased again. To be honest it isn't a huge problem (it irons quite easily at any rate, so at least it's not a pain to do) although if you're going to be spending a lot of time sitting down it might look quite crumpled after a while. At some point I might try steaming it; I wonder if this would at least help to prevent it getting creased as it's being ironed. Although Banned refer to the colour of the skirt as "blue" (and as such it's listed this way everywhere I've seen it online), the product description on the Blue Banana website calls it turquoise and I personally might even go so far as to call it green. It's looks quite blue in these photos but I'm not sure if I'd wear it with a blue cardigan, for example. Maybe I will try it and see. On the other hand I have some shoes and a bag in a turquoisey kind of colour which might suit it much better. Anyway, all I'm trying to say is - I know different people perceive colour differently but to me this is much more green than I was expecting based on what Banned have decided to call it. I think that's pretty much it from me for today, but I will leave you with a faintly ridiculous photo of me taken just after the wind finished lifting my skirt up. See you all soon and please do let me know if you have any advice or tips for the lens!